Thomas Wirt (a.k.a. 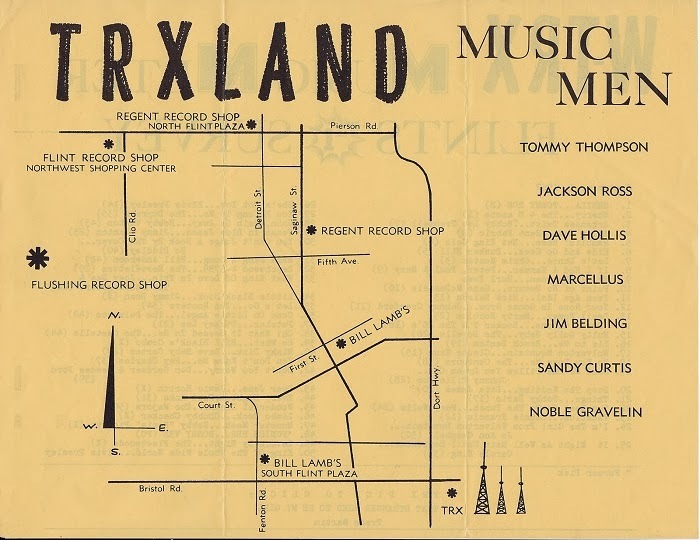 Jar With Most) is a photographer who captured the essence of Flint starting way back in the seventies. 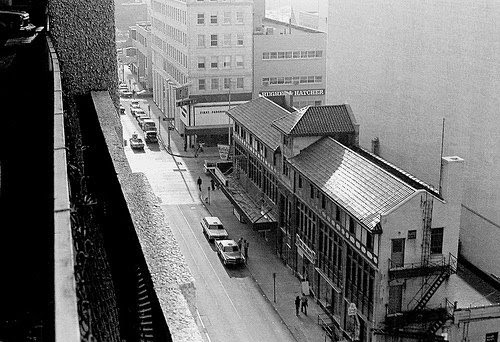 Here's a 1977 view of the corner of South Saginaw and First Street from the parking structure of Genesee Towers. Smith-Bridgman's looms in the background to the right, behind a wall of bricks. The Book Stall is visible in the lower right corner. For more of Wirt's photos, go here. 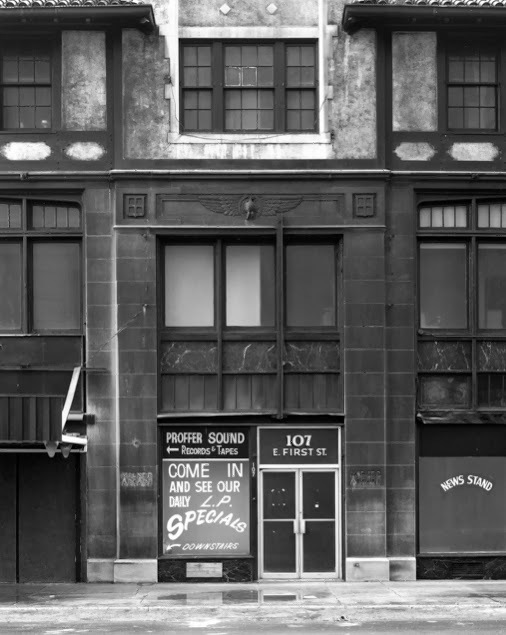 A close-up of Milner Arcade by photographer Gordon LaVere shortly before demolition. 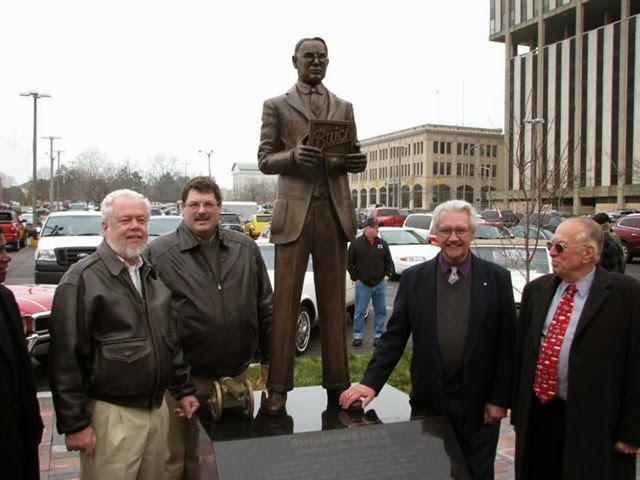 The statue of David Buick at its unveiling in front of the parking lot once home to Smith-Bridgman's and Milner Arcade. 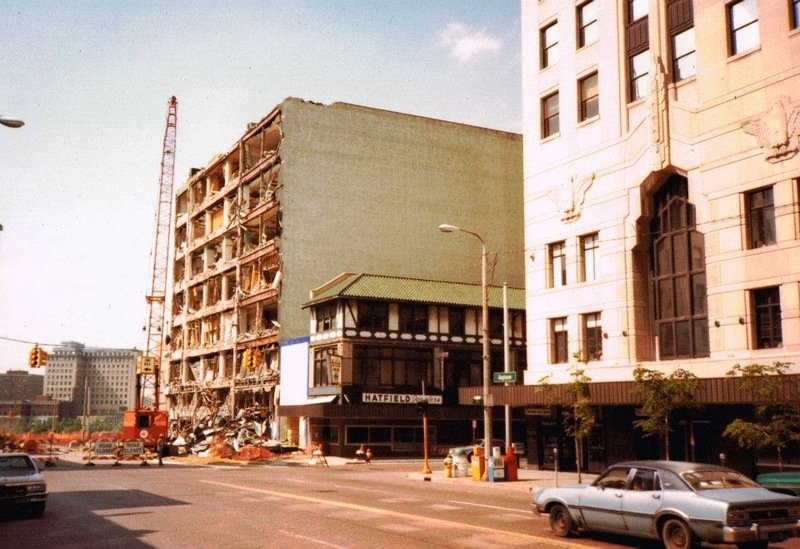 The recently demolished Genesee Towers is visible in the top right corner. 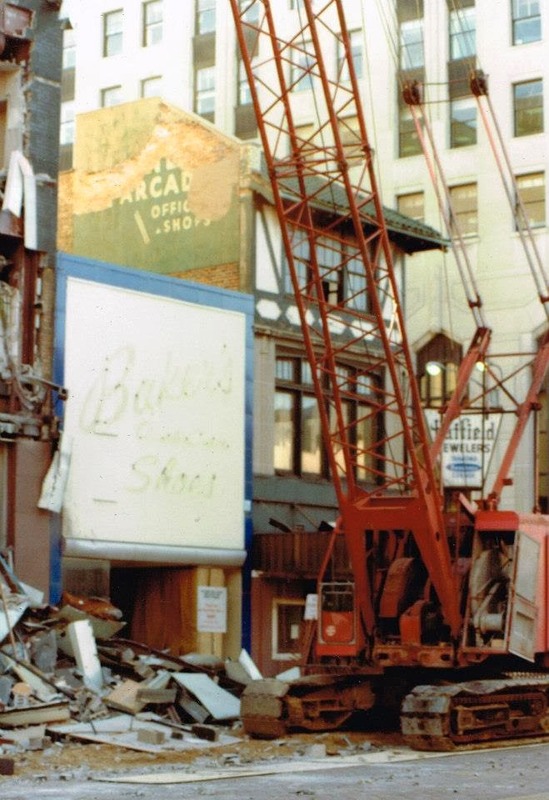 I’ll not forget the day these demolition photographs were taken. I was driving down Court street early that Sunday morning, glanced north, and noticed the crane in the middle of Saginaw street. It could mean only one thing; after starting from the river and tearing down everything in sight between Saginaw and Harrison streets for the proposed Water Street Pavilion and its giant surface parking lot, the demolition crew had finally gotten to the Smith-Bridgman building. There was a group of preservationists, of which I was one, that had been trying hard to save the historic facades on this block. I had advocated for a modified version of a scheme used in other cities, where the building faces were kept, while new structures were constructed behind them. 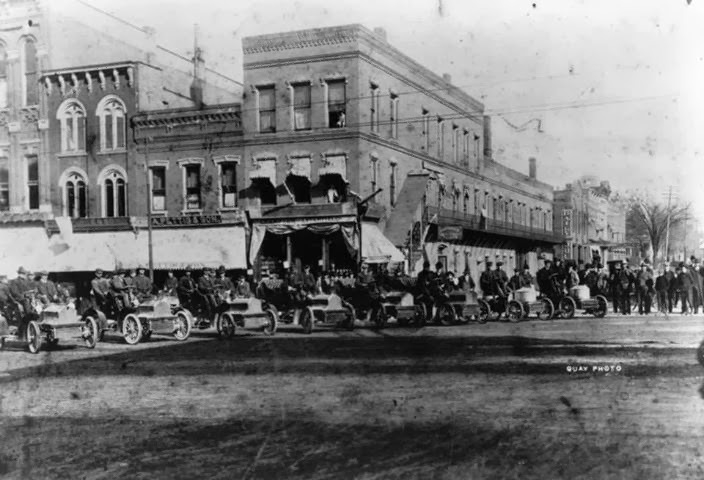 In this case, the plan would be to salvage the front thirty or so feet of all of the buildings on this block, essentially converting them into shallow lease spaces, similar in depth to the Milner Arcade building, which would also be saved. But it was just one of many creative ideas rejected by the powers that were, even though they would have still gotten their parking lot. Few people seemed to know how magnificent the original front elevation of the Smith-Bridgeman building, in particular, had been, since acres of teal colored sheet metal had been placed over it decades before. It made sense that the contractors were demolishing the façade first, early on a Sunday morning, so as to reduce the chance that too many people might discover what they were losing. I turned and drove up to the site in time to find that the metal had been stripped away to indeed reveal what I had longed to save: the original, finely proportioned, cut stone and brick façade, none the worse for wear, with every wood framed plate glass window intact, each still complete with their wooden venetian blinds. I was struck by how pleasingly gracious and beautiful it was, a symbol of a more discerning time. The shadows are a testament that it was late in the day when these pictures were taken; only hours after Flint’s finest architectural facade poignantly succumbed to yet another case of unmitigated short-sightedness. This is how the housing speculators help destroy Flint. Check out this property listing on eBay for 2322 Delmar Avenue in Civic Park, not far from Haskell Community Center. I spent a lot of time on this street as a kid and more recently while house hunting and writing Teardown: Memoir of a Vanishing City. The New York owner describes it as a “great investment property!” It’s not. Delmar is one of the most abandoned and desolate streets in Civic Park these days. 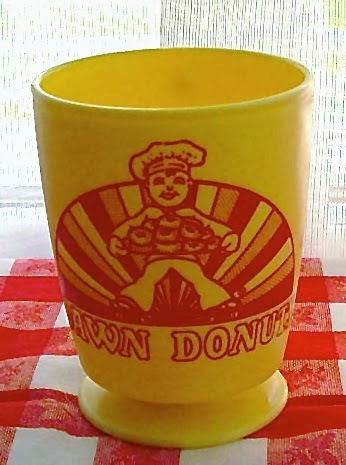 The setting is described as “suburban.” Also not true. The Zillow estimate is a testament to the flaws of online housing valuations and deceptive advertising: $40,000. Not even close. The condition: “Needs some repair.” That’s technically accurate but doesn’t reveal that the house has probably been stripped clean by scrappers. 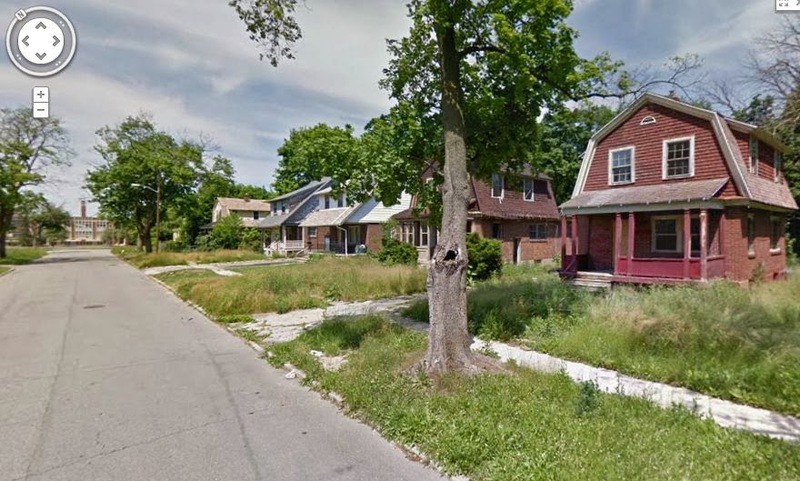 Some clueless “investor” looking to make a quick buck could buy this house without knowing just how troubled the neighborhood really is right now. Then walk away from it down the line. The county will be left to deal with it at taxpayer expense. "Thank you for your interest in the property. Please do not mind the wordings of my answer, these are investment properties which are going to sell in few hundred $, so this is buyer's responsibility to complete all due diligence needed to determine the condition or taxes. We are buying in bulk 15-20 properties and selling as is, and giving the information we have got from our selling investors or banks because we never visited these properties. "I never been there, these investment properties are available for a limited time. As soon the economy in that area will get better who will sell these houses in these prices?. So the wise are collecting these lottery tickets now." Great to know that Flint houses are nothing more than lottery tickets to these speculators, something to just throw away if they don't get lucky. 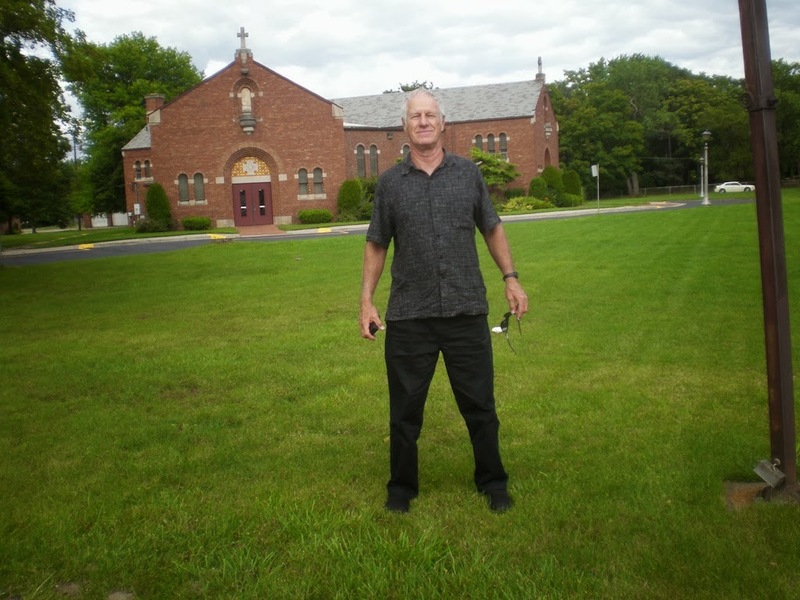 Peter Bourque on a visit to St. Agnes in August. 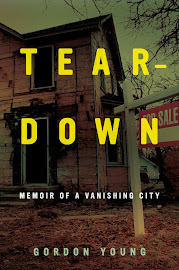 Author and educator Peter Bourque grew up in Flint and lived in the Vehicle City from 1954-1971. He attended St. Agnes School, where he also served as an altar boy. 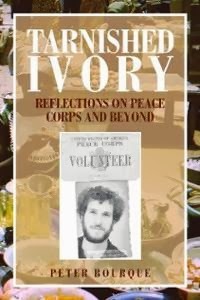 As a Peace Corps Volunteer in Ivory Coast (1973-75) and a Peace Corps trainer in Mali (1986), Peter Bourque kept a personal journal and wrote over 55 letters back to the States. In them, he described the satisfactions and frustrations of living, working and traveling in West Africa as well as his reactions to the people he encountered-Ivorian, French, Malian and American. Decades later, he reflects and elaborates on these writings with current-day observations and candid essays about idealism, world poverty, the Peace Corps, the French, and losing his religion. 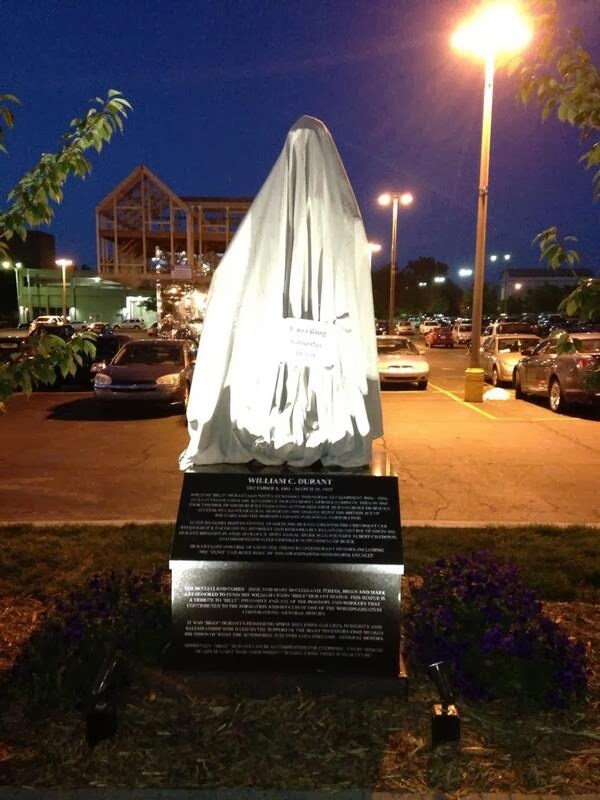 Culturally, Flint was sophisticated for a factory town of its size and included the Cultural Center, a large community college named after local philanthropist Charles Stewart Mott (a former GM vice president) and a branch of the University of Michigan, which I attended. In the '60s and '70s, the stability and continuity of GM families in Flint was remarkable. I went to the same Catholic school for 12 years, as did many of my classmates. College-bound juniors and seniors from the Catholic schools attended monthly presentations at General Motors Institute that covered a variety of topics. 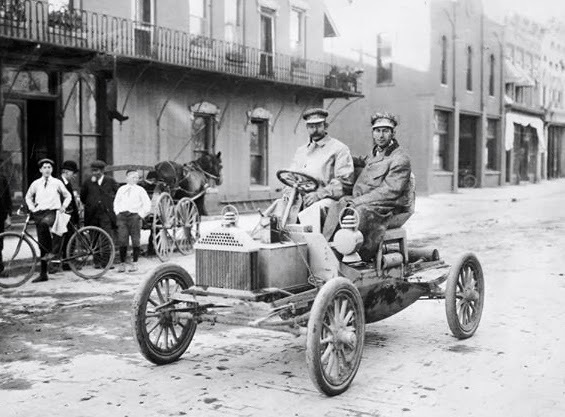 Young adults who weren't going to college or who dropped out could easily get jobs on the assembly line that were well-paying and unionized with amazing benefits — those same benefits that contributed to GM becoming noncompetitive in the auto industry. In my mind, working for GM was a trap that many 18- to 20-year-olds fell into. Nonskilled workers were lured by the security and financial incentives, which overshadowed what were often mind-numbingly tedious jobs "on the line." "Only 25 more years and I can retire," you too often heard them say. The Library of Michigan has announced the list of the 2014 Michigan Notable Books — 20 books highlighting Michigan people, places, and events. Books that showcase the range of experiences of Michigan's citizens and life in the Great Lakes by well-established and first-time authors can be found on the list. 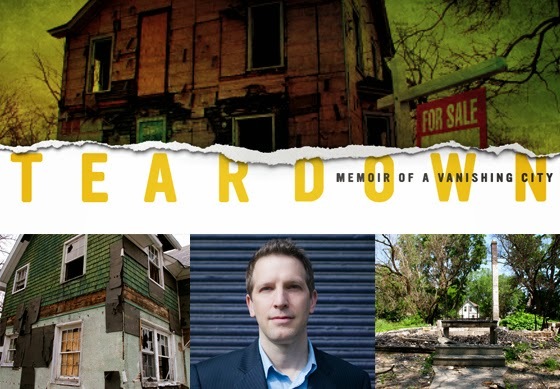 Winners include Detroit: An American Autopsy by Charlie LeDuff, The River Swimmer by Jim Harrison, and Teardown: Memoir of a Vanishing City by Gordon Young. “The Michigan Notable Books Program helps to show what is ‘great’ about the Great Lakes State,” said State Librarian Nancy Robertson. 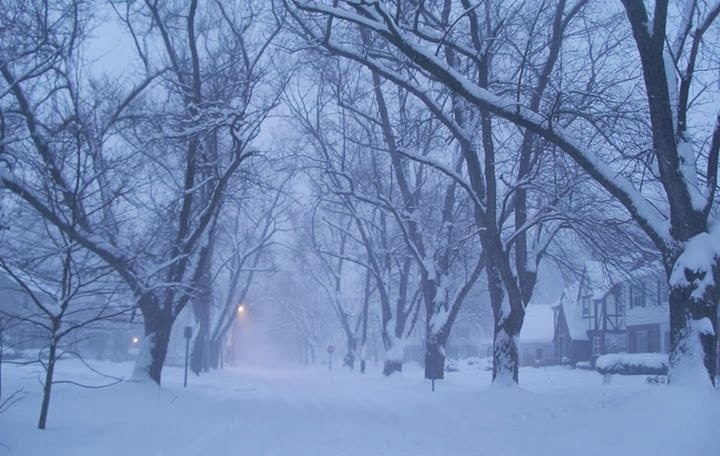 The 2014 list includes titles covering topics as diverse as a detailed discussion of Chief Pontiac’s Rebellion; a biography of Mark “The Bird” Fidrych; a memoir of Flint; a children’s graphic novel about Buster Keaton’s summers spent in Muskegon; an anthology of some of the best Michigan poetry; the deadly Great Lakes hurricane of 1913; a collection of articles studying the Great Lakes sturgeon to a book highlighting the joys of baking and eating pies. 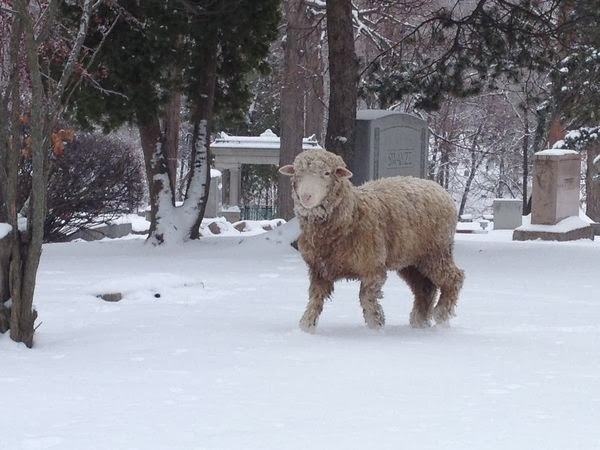 "The Christmas sheep of Mott Park is not a myth. "I've seen it with my own eyes. "Three days after the sheep made its escape from the West Court Street Church of God's annual Nativity scene Christmas Eve, I came face-to-face with the creature Friday, Dec. 27, as I wandered through Glenwood Cemetery in search of the beast. "I have returned to tell the tale."